Heartbreak Hill, surely a scene of troubled love at this particular Radnorshire spot in years' past?. But wait a minute, here's Amen Corner, Fine Alley, and over there, Shed a Tear, and thoughts of a lovesick shepherd roaming this grassy slope clutching his returned Valentine's card disappear as swiftly as the curlews and peewits flying towards the surrounding Radnorshire hills. We are in fact at Rhosgoch Golf & Leisure Club, a focal point of the local community, and one held in great affection. Set in sweeping countryside, the area is bordered by the hills of Bryngwyn, Newchurch and Ireland, and across to the west the smooth slopes of the Begwns. Snootiness is not an option at the club: there is no dress code, the welcome is warm and friendly, and markers identifying each of the greens on this nine-hole course have been finely chiselled by a retired sculptor. Peter Michel, whose own impressive career brought him into contact with such dynamic film sets as Indiana Jones, the adventuring character made famous by Harrison Ford, and Star Wars, claims that the club is "unique". Once a local farm, it was opened in 1984, and nearly 10 years ago a group of 16 golfing devotees at Rhosgoch bought the clubhouse and 28-acre site which is now run by a committee of members. There is deep affection for this place, which has no pretensions, only a reputation for an informal and relaxed atmosphere with a large function room, and a bar with an open licence, where conferences, weddings, annual dinners and other special occasions are held. "There are no 'cliques' here - only one big clique, which is nice," says Peter, a sculptor and painter who lives at Colva. "I couldn't believe my luck when I found how friendly everybody is." After training at Goldsmiths College in London, much of his career was spent working with smooth Portland stone, but after "just mentioning" to players at Rhosgoch that he could carve stone, was to find himself eagerly steered towards nine lumps of rugged Radnorshire rock. 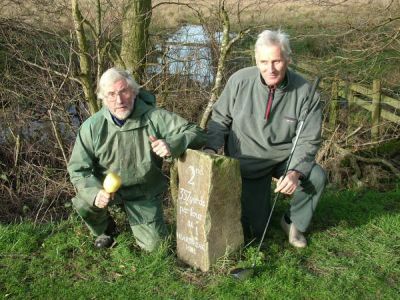 "Every tee should have a proper marker," he explains, "and I carved yardage and names on all the stones, among them Heartbreak Hill - it's a long hole and goes up steeply - Shed a Tear (near the shed), Twin Oaks, and Amen Corner (a dog leg corner) and finally, 'Fine Alley'." Club steward Norman Lloyd, who lives at Newchurch explains how Amen Corner got its name. "If you blow it at this point, then it could well be 'amen' to the game!" His introduction to golf came via a chap who helped with a project to do up his ancient house. "He was a keen golfer, and that got me started," he says. Every year, the club hosts a special England v Wales Ryder Cup, the most recent event captained by Norman for the Welsh, and his brother, Isa, for the English. "We were both born in Herefordshire, but I reckon to be Welsh as I've lived in Radnorshire since I was six," he says. "It was very competitive on the day, flags flying. but it was a bad result because the other side beat us!". The club is greatly loved and respected, and players are only too happy to muck in and help with painting and decorating, nurturing tubs of flowers, or tending the course itself. Norman points out that Peter is "artistic consultant" to the club. "We always check if we've got the colours right before we start painting!" 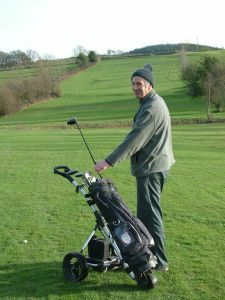 Peter is also part of a team dedicated to mowing the fairways, and the marker stones he deftly carved add yet another dimension to the popularity of this club. Its location is unique, lying on a gentle hillside where it rubs shoulders with 100-acre Rhosgoch Bog, a site of Special Scientific Interest, and one of the few 'quaking bogs' remaining in Europe. Thanks to its close proximity, golfers can often be pleasantly surprised by the sight of curlews, peewits, red kites and black-headed gulls among a host of other wildlife species. This is a spot where everybody can find a welcome. Children from Rhosgoch primary school play golf here on Saturdays, and Norman reports a healthy membership of up to 50 junior players. "They have a series of lessons in the summer, and we try to keep it going in the winter," says Norman. "Once every month there's a competition for them." Adult players drive here from as far afield as Kington, Presteigne, Talgarth, even Hereford, and at the latest reckoning there are 50 men members, and 10 ladies on the books. "We're not very big as a club, so we are all one big gang," he says. The clubhouse bar and function room are frequently used for community events both private and public, and showers have also been specially installed for weary players from Rhosgoch Football Club, who used to play away at Hay-on-Wye, but now have their own field nearby. After Peter left Goldsmiths', he began a career carving stone in churches, and eventually moved into theatre. Local audiences might have seen evidence of his expertise during village pantomime productions at Gladestry, where he has produced highly effective props. In the past he has worked at Elstree and Pinewood film studios, conjuring up some of the magic that went into the making of such movie greats as Star Wars and Indiana Jones and the Temple of Doom. "Oh yes, I worked on the 'Doom' - lots of doom in the caves!" He says he plays off a handicap of 23 (Norman's is 14). "I wasn't very good when I started, and I'm still not very good now, but I love coming here. I can't believe my good fortune in finding such a cheerful, happy club, where everybody puts so much into it. "There's even character to all the nine holes on the course - it really is very nice, and to think this was once two farm fields!"